British Olympic dressage team gold medallist Carl Hester will be in Australia in November for Equitana Sydney. At his home in the heart of British horse country in the beautiful Gloucestershire countryside, he shares an insight into his methods and his stables. As I sit in the car staring at the horse silhouettes mounted on the black wroughtiron gates that are opening before me, I feel a sense of anticipation and nervousness. I’ve visited many top riders’ yards, but behind this gate lays the expected paradise of arguably the most talented man in dressage, Carl Hester, and the horses that have made him so famous. I’m here to see how the professional stable of Carl Hester is managed, the team behind the man (and the horses) and everything that goes into creating the quality and standard we have come to expect. As I proceed up the tree-lined driveway following the post-and-rail fence that provides a boundary to my right, the scene that unfolds before me does not disappoint. The yard is situated on a 20-acre property near Gloucester in England. Carl bought the old mill house and has built on to it bit by bit, lovingly crafting and designing everything based on ideas he has gleaned from yards he has visited, always ensuring the buildings are functional, practical, yet beautiful. Carl has set up the property with feeling and functionality and the layout ensures that use of the facilities is optimal and effective. One noticeable variation from other yards is that the stables and feeding areas are separate from the arenas and tack room. This allows the horses to feel peaceful and relaxed when stabled, fed or in the fields, and clearly understand it is work time when they are in the preparation area and arenas. Entering the stables through an archway clock tower, I’m greeted by well-bred and cared for horses, including the stars, Valegro and Uthopia. The stables are arranged around a courtyard with the horses facing each other. Each stable is large, light and airy with rubber flooring, automatic waterers and an additional window facing outside into the fields. I am always intrigued by tack rooms, and this one, as with all professional stables, is reflective of the order and precision with which the yard is run. As I look around the room and take in the ribbons, photos and medals that adorn the walls, I’m reminded that I’m not in just any yard, these are the saddles and bridles worn by the horses that have made history. Saddles are mounted and lined up on one wall, bridles hang below signs of the appropriate horse’s stable name, saddle blankets and rugs are neatly folded and stored on racks. The many bridles are spotless and gleaming. Yard manager Fiona says that they are all cleaned daily to maintain that standard. Carl tells me that the horses are all worked in snaffles in training, and for a week or two in the lead-up to a competition, the doubles come out. We move outside, past the horse walker, the outdoor arena and the muck heap through to the now equally famous fields. Carl seems perturbed that the public and media have taken such an interest in the fact that his horses are allowed field time. “No one asks eventers if they think they won an Olympic medal because their horses were in the fields,’’ says Carl. I hope that this is a sign that attitudes towards permanent stabling, particularly in the UK and Europe, are slowly changing. We both agree that luckily for us in Australia this is less of an issue. As we walk through to the fields, we pass Carl’s up and coming GP horse, Dances with Wolves, being taken for a hand-walk and graze by groom Alan. In the nearby paddock there are three horses grazing together, and despite all I’ve heard I’m still surprised to hear that they are a PSG, Inter I and GP horse (yes, as a herd, all in the one paddock). On asking what boots they wear, I’m told that most of them go without boots. They have more injuries and rubs from boots than from not wearing anything. The top horses wear overreach (bell) boots only. Despite this, or perhaps because of it, Carl’s horses are rarely injured. I spoke to them about how so many horses can be ridden at this level and yet not have some of the typical problems that plague many other riders, including us at home. I was advised that the reason for this is simply maintenance. A holistic maintenance program covers the whole horse, inside and out. Feed regimens, physio and equipment – such as the Activo Med Therapy System (evenly distributing PEMF and cyclonic massage therapy to the entire horse), horse walker and solarium – coupled with the opportunity, as Carl says, to “just be a horse” and the natural and unforced work that Carl and Charlotte produce. “To keep a horse sound, they need to be out and moving,” is Carl’s firm belief (this seems to extend to his chickens which are all free range too). These horses are kept moving with four days a week arena work, two days of hacking, and a day off where they get turned out or go on the walker. On a work day, they are prepared for their session with an Activo Med Therapy treatment, then the riders take them for a 10-15 minute hack before they come into the arena and do 20 minutes of stretching in walk, trot and canter on a long rein. So, by the time Carl and Charlotte get on, the horses have had half an hour of warm-up and can get straight into real work with transitions and movements. They are then passed back over to a rider for 15-20 minutes of walking to cool down. They get untacked, cleaned up (with warm water), legs iced if necessary, and back to the stable. In the afternoon, all horses are turned out, put on the walker or hand-walked. Up to eight horses live outside full-time but the others are brought back in; they receive a recovery session with the Activo Med System and are back in their stables for dinner. This all takes a lot of work, and it’s a team that keeps it going. Yard manager, groom, personal assistant (jack of all trades), riders, physios and more, it can’t be done without these people. As with all teams, they need to work cohesively to achieve the common goal. 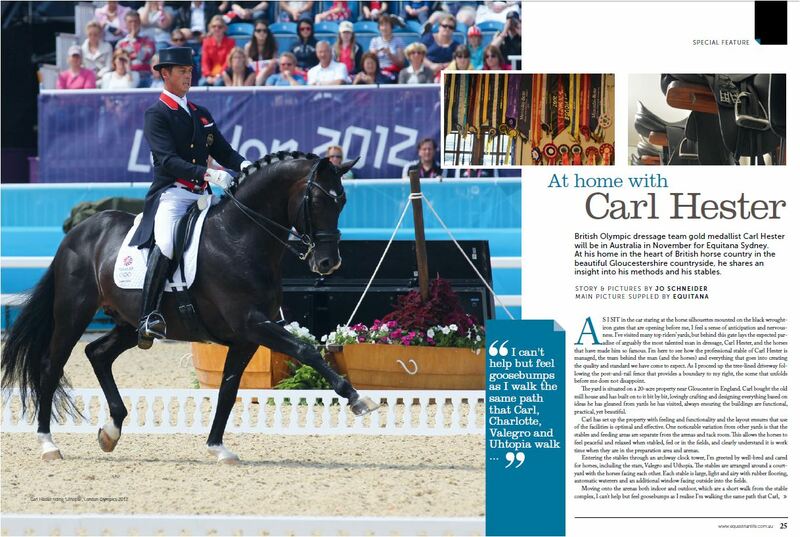 So what’s next in the world of Carl Hester? Carl is planning for the 2014 World Equestrian Games in Normandy with Dances with Wolves. He is a “hot horse” that needs as much exposure as possible, so Carl needs to plan a good career path for him to build up to the Games. Similarly for Charlotte; he helps to plan and sculpt her future and would “love to see her become world champion”. And as you’d expect, they want to see the British team to win gold at Rio. But for now, next up is the National Championships and then a well-earned break until after Christmas. This is except, of course, for when he graces our shores very soon for Equitana. I ask him about this impending trip and if he is looking forward to it, to which he replies, “yes, very much”, he “loves Australia”, he says, and in fact his sister lived and was married here. On my response that he is therefore “practically Australian” he jokingly agrees and tells me it’s “beaut” in a typically English attempt at an Aussie accent. We laugh and I feel that maybe we’re a step closer to claiming Carl as “our own” as us Aussies like to do.